You read it first on AutoColumn. Honda Activa 125cc will be launched in the first week of April. Our sources from company informed us that the trainings have been started for mechanics for product K-24 (Activa 125). Honda showcased Activa 125 at 2014 Auto Expo. Activa 125 is a product from Honda to get into market in par with competition for higher cc scooter. Activa 125 will be powered by 124.9cc engine that churns 8.6 bhp and 10.2 Nm of torque. This new 125 cc engine puts out extra power and torque compared to 110cc engine that powers current range of Activa scooters. The new scooter from Honda also got HET treatment to have good numbers for fuel economy. The company claims that Activa 125 will be the most fuel efficient scooter in its class. The full metal body scooter will get combi brake system, disc brakes as optional package and telescoping front suspension. The instrument cluster is now all digital to add overall new age styling. The unique fact about this scooter is its wheel size, front wheel is 12 inch whereas rear wheel is 10 inch fitted to 5 spoke alloy wheel. Honda Activa 125 shows a masculine styling to target the audience as an unisex scooter and will be available in 4 different colours: midnight blue, black, pearl white and sword silver. Activa 125 will be third scooter in Activa range after Activa 110 and Activa-i. 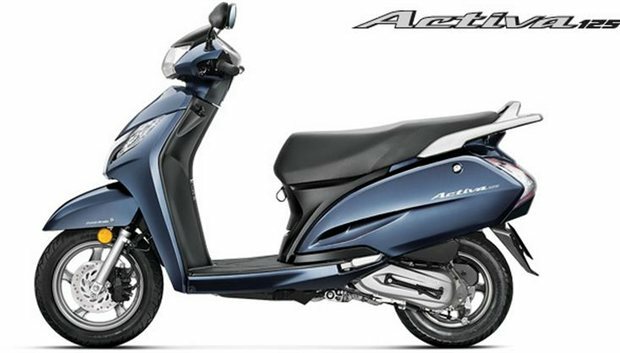 With all the features and addons, we expect the pricing of Activa 125 to be close to Rs. 55,000. 125 cc Activa will compete with Suzuki Access, Suzuki Swish, Piaggio Vespa and Mahindra’s Duro and Rodeo. Hero MotoCorp does not have any product in 125cc segment of scooter and soon the company will launch 125 cc Hero Dare scooter and premium Hero Zir 150 scooter. Activa 125cc brochure is already leaked and you can find a report from 4wheelreviews about it here.